Home Sign up for the Cucicucicoo Newsletter! Sign up for the Cucicucicoo Newsletter! Do you love free patterns, fantastic tutorials, easy-to-follow technical lessons and the latest news in the sewing and crafting world? Of course you do! So what are you waiting for?! Sign up for the Cucicucicoo Newsletter! The Newsletter is sent out every two weeks with interesting information and links to at least one free pattern every time! 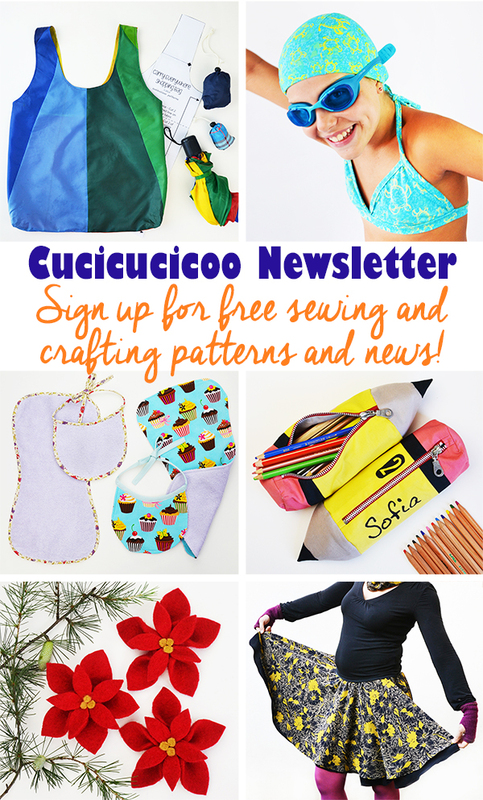 And as an extra bonus, Newsletter subscribers get exclusive access to all the FREE downloadable PDF patterns and templates available on Cucicucicoo! Hooray! After you’ve confirmed your Newsletter subscription, you will receive an e-mail with the password to the private members-only section of Cucicucicoo, where you can download any or all of my free materials! Don’t worry– you can change your subscription settings or unsubscribe any time you want. Click here if you’d prefer to sign up for the Italian language Cucicucicoo Newsletter. As soon as you’ve filled out the above form, check your email for a message with a link to click to confirm your subscription. If you do not get the subscription confirmation e-mails, please check your spam. If you still cannot find the e-mail, please click here to use an off-site form. If you have any questions, feel free to write to me at lisa@cucicucicoo.com and I’ll respond as quickly as I can! I’m looking forward to having you with us!